2nd rd do 2 of everything, 3rd round 3 of everything…and so on. Sign Up for the open. Click here to see others who are also comepting for the first time! When did you start crossfitting? The end of November 2012. Why did you start? I wanted a competitive aspect to working out where someone would push me, which SRC does. Otherwise I would go to a gym for a couple months and quit. The workouts are a challenge, especially for me, and they can be a lot of fun also (some, not all). Oh yeah, I needed to lose weight and get into shape. What were your thoughts after the first workout? Good stuff. Intense. I wanted to do it again. What is your favorite WOD? The twelve days of Christmas. Least Favorite WOD? The twelve days of Christmas. Least Favorite Lift? Dead lift. 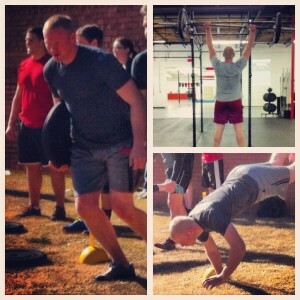 What are your interests outside of crossfit? Caring for and spending time with my wife and son. Living out what I learn from Christ through prayer and Bible study. Outdoor activities such as: hiking, camping, and fishing. What advice would you give someone just starting crossfit at SRC? Listen to the coaches, ignore the pain and have a goal in mind at each workout. What is one thing we might not already know about you? I used to be a massage therapist.